Kara graduated from Charles Sturt University in 2004 and completed her graduate year rotating at Albury Wodonga Health for two years. She continued at Albury Wodonga Health for another year as the senior physiotherapist in cardiopulmonary before trekking off to Ireland. Kara expanded her skills working at the Dublin International Orthopaedic Hospital and in private practice. After two years in Dublin she returned to Australia living and working in Hobart. This is where she found her love for musculoskeletal and clinical pilates. After seven years in Tasmania she returned to Albury. 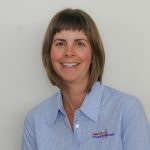 She has strong interests in the assessment and management of shoulder and spinal injuries, clinical pilates, chronic pain and eating disorders. Kara is also a Nordic walking instructor and a mentor for Polestar pilates. She is also skilled in the art of real time ultrasound for the assessment and treatment of complex injuries.